Reparations are a restitution for slavery - an apology and repayment to black citizens whose ancestors were forced into the slave trade. It's a policy notion that many black academics and advocates have long called for, but one that politicians have largely sidestepped or ignored. "America came along as the first country to end it within 150 years, and we get no credit for that," Katie Pavlich said on Tuesday, adding that reparations would only "inflame racial tension even more". Fox's Pavlich complains that America gets no credit for ending slavery. Bernice King, daughter of Martin Luther King Jr, responded by saying America "doesn't deserve credit for 'ending slavery'" when the ideologies are still prevalent. America doesn’t deserve credit for “ending slavery.” What America ended (on paper) reflects an ideology and a quest for power at the expense of humanity that are still prevalent in the policies, spirit and mores of this nation. Even after the technical end of the slave trade, black Americans were denied education, voting rights, and the right to own property - treated in many ways as second-class citizens. Prof Darrick Hamilton, Executive Director of Ohio State University's Kirwan Institute for the Study of Race and Ethnicity, says this history is part of America's unique problem. 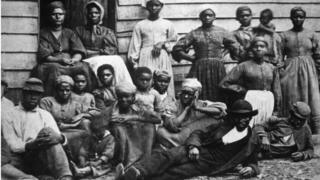 "From our founding fabric we have based our political and economic institutions on chattel slavery," he told the BBC. "Which makes our institutions not only pernicious but structurally entrenched [in inequalities]." "The material consequence is vivid with the racial wealth gap. Psychologically, the consequence is [how] we treat blacks without dignity, that we dehumanise them in public spaces." From policies excluding primarily black populations - like social security once did - to pushing narratives that blame black Americans for their economic problems, Prof Hamilton says the US has structural problems that must be addressed in order to move forward. Coates detailed how housing policy and wealth gaps in particular most clearly illustrate the ways black citizens are still affected by America's past. Decades of segregation kept black families away from white areas, which had better access to education, healthcare, food and other necessities, while institutionalised discrimination hindered black Americans' economic development. "As we go further back in our history, one can see it as explicitly violent," Prof Hamilton says. "Now it might be implicitly violent." One argument against reparations echoes what Fox's Ms Pavlich said - that they would only build walls between Americans. "For the United States to do the same for the descendants of slaves would be to imply that afterward, we will be going our separate ways, with no special obligations on either side," columnist Megan McArdle wrote for the Washington Post. "A one-time payment, and then nothing more owed...That is the only conception of reparations that could possibly be politically viable. It would also be utterly toxic, ultimately widening divisions that we're trying to shrink." Bayard Rustin, who organised the March on Washington and was a friend of Martin Luther King Jr, called it a "ridiculous idea". "If my great-grandfather picked cotton for 50 years, then he may deserve some money, but he's dead and gone and nobody owes me anything," Mr Rustin told the New York Times in 1969. He later expanded on the views, writing that a payout would demean "the integrity of blacks" and exploit white guilt. "It is insulting to Negroes to offer them reparations for past generations for suffering, as if the balance of an irreparable past could be set straight with a handout." "In any case where there's an injustice, to achieve justice not only do you need the acknowledgment, you need the restitution." "We need to couple it with an economic justice bill of rights," he adds. "Simply paying the debt doesn't address the structural problems America has, with certain classes of Americans being able to extract and exploit." But acknowledgement isn't "trivial", he says - it would help refute existing narratives that dehumanise black Americans as lazy or dysfunctional. Economist William Darity has also suggested a "portfolio of reparations" that would combine payments with black-oriented policies focusing on funding black education, healthcare, and asset building as well as ensuring that public schools properly teaches the full impact of slavery. President Barack Obama never endorsed a reparations policy - nor did 2016 candidate Hillary Clinton - but next year's presidential contenders have been more outspoken, if vague. Senator Kamala Harris has said she is in favour of "some type" of reparations. In February, she told The Grio: "We have to recognise that everybody did not start out on an equal footing in this country and in particular black people have not." She has proposed the LIFT Act, which would give families earning under $100,000 annually a tax credit, benefitting "60% of black families who are in poverty". Senator Elizabeth Warren has also expressed support for reparations, calling racial injustices "a stain on America" that has "happened generation after generation" at a CNN town hall this month. "Because of housing discrimination and employment discrimination, we live in a world where the average white family has $100 [and] the average black family has about $5. It's time to start the national, full-blown conversation about reparations in this country." "Right now, our job is to address the crises facing the American people and our communities, and I think there are better ways to do that than just writing out a cheque,"he told ABC's The View this month. Senator Cory Booker, like Mrs Harris, has proposed a "form of reparations". Former San Antonio Mayor Julian Castro said the idea of reparations was something "worth" discussing. She has floated the idea of a $100bn "educational, economic and cultural fund to be disbursed over a 10 year period by a council of esteemed African American leaders". "The conversation in and of itself is valuable. It's opening the door to reframe our understandings of racial inequality overall."